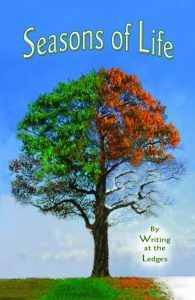 Writers of all stripes, genres, talent levels and ages have found a home at the Writing for the Ledges group, which recently published “Seasons of Life,” its second collection. Senior writer Alta C. Reed, who started writing at a young age, has an entire chapter in the book titled “Seasons of Alta.” In her short essays she writes about topics as diverse as her life before electricity and Senior Skip Day in 1939. Her biography describes how she still has an essay she wrote in the third grade and a story she wrote in 1939 about her senior trip to the World’s Fair. On the other end of the spectrum, Shelby Pontius, a senior at Grand Ledge High School, contributed a short story titled “The Year Santa Go Stuck in My Chimney.” In her biography, Pontius says she has a passion for writing rhyming poetry and plans to attend Michigan State University after graduation. Petrouske says the number of first–timers represented in the book shows the level of interest in the writing group, which was founded in 2005 and now boasts 30 members. The Lansing Community College writing instructor said that five years is a long time for a group to stay together. She said the group works together to encourage new writers and 10 of the 24 contributors to “Seasons of Life” were new to this second collection. Writing at the Ledges published its first anthology, “Small Towns: A Map in Words” in 2008. Asked why writers join a writing group, Petrouske said writers like to get feedback on their work. “They want to see if it is working and if others get it. They want to know if their writing is doing what it’s supposed to do. Petrouske also attributes the success of the writers’ group to meeting on a Saturday, when more people can make it. She also said the group encourages the members to try new styles and genres. “One half of the group never wrote poetry and now all are trying to write it,” she said. And although the group may soon have to limit membership or break off a new group, Petrouske and numerous fellow contributors are doing a series of signings at which interested writers can ask about writers’ groups.